I highly recommend Oxana Dodon as both a Soloist as well as a Leader of Orchestras. She is highly talented, technically gifted and an excellent performer. I have had the pleasure of playing with Oxana on a number of occasions and found her to be very professional and exceptionally easy to work with. Oxana Dodon is an especially accomplished Violinist. 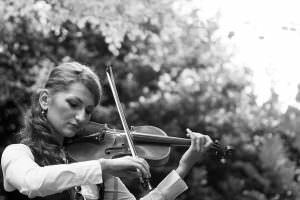 Oxana is a superb Violinist with immense talent. She has a wonderful future ahead of her and has already achieved much in her career. Oxana is a special guest. Oxana is a specially talented soloist and I am honoured to work with her. Oxana is a talented professional Violinist and distinguished guest of the WemsFest Celebrity String Ensemble. Hearing the first note from Oxana’s bow we knew we were in for a musical treat. Her commanding stage presence, her mastery of technique, her deep understanding of the composer’s intentions made for a mesmerising experience. Being a native of Moldova one sensed a special empathy with Tchaikovsky’s work which gave colour and magic to Oxana’s intuitive interpretation of this great concerto. It is difficult to criticise such a magnificent performance, combining as it did, her soaring arpeggios, thrilling scale passages and heart-stopping harmonics. One was left with the thrill of hearing such a virtuoso at work on our local stage giving a performance which would find acclaim on any concert platform.